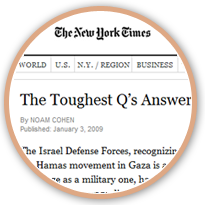 It was getting quite clear for us in the Public Affairs team at the Consulate General of Israel in New York that if don’t take action to participate in the debate and answer direct questions, the contributed views will remain one-sided and hostile. We decided to take immediate action. But what could we do? As a political entity, we were stuck between a rock and a hard place. On one hand, we wanted to make sure the discussions include Israel’s reasoning. Whether people agreed with them or not, it was essential to make sure that the discussion would stop being one-sided, at least. On the other hand, as a government, any public statement will likely be taken with dismissal from the public. We wanted to show people that behind the “consulate” identity, there are actual people who care about their concerns and want to address their questions – for better and worse. Consul Saranga and myself analyzed the situation online and reached a conclusion: We need to be honest, we need to be clear, and most importantly, we need to be approachable. We decided to launch a special “Citizen Press Conference”, on twitter, for anyone to ask us, as official representatives of the state, any question they deem important. Even before the conference started, the responses were explosive. 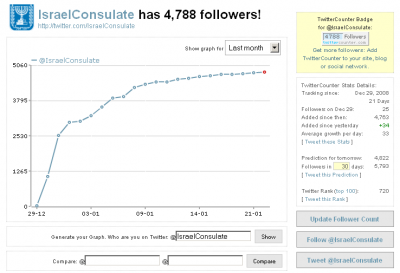 Within 24 hours, the consulate account had 2500 followers, and at the time of the event itself, the account had around 3000 followers. As you can see from the graph below, these weren’t just temporary followers, they stayed after the primary event, and the trend continued to grow steadily over time. During the next couple of days we continued posting occasional teasers to the conference. We made sure to answer the questions that popped up with a reminder to the official press conference, and continued to show that our presence is steady. Thanks to all of you, the responses to our new twitter account were amazing! We can’t wait for tomorrow’s event. We also made sure to promote our blog, and, as you can see, we made sure our tone was not ‘governmental’ but rather personable and friendly. This wasn’t just an act – we wanted our audience to feel comfortable approaching us with questions, and set up the ground for people to hear the “other side” of the situation they saw on the news. The day has come; we announced, we set things up, we planned, and it was time for the execution. At noon on December 30th, we started setting up the room. We used three laptops connected to WiFi. Consul David Saranga walked around the stations to read the questions that bombarded our account. We asked the participants to use the hashtag #AskIsrael. That way, people wouldn’t have to mention the consulate’s name directly to be answered. Two computers were used to read the questions and then formulate Consul Saranga’s reply into 140-character tweets. The third computer (with me) was used to handle the technical aspects, make sure tweets were passed on to the content team, and control the heavy flow. Only tweets that were rude without substance (like curses, racial slurs and the like) were ignored. The rest – “good” or “bad” questions – were ignored. It was extremely important for us to answer negative questions as well as positive. We were there to communicate and show we are approachable. We received over 600 tweets during the 2 hours of the event, and answered almost 150 of them, all in 140-character tweets. It was tiring, but well worth it. Overall, the project was a complete success. 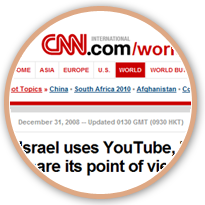 The Israeli Consulate received support for the effort to communicate, even from people who are politically opposed to its conduct. The project appeared in many media outlets, the most notable of which are displayed below. 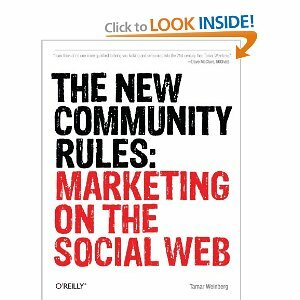 The project was also mentioned in Tamar Weinberg‘s book “The New Community Rules: Marketing on the Social Web“, published by O’Reilly Media. Though the event itself was over, our goal was to open up direct communication to the brand. That meant we could not just abandon the twitter account; on the contrary, now it was up to us to continue being approachable. We wanted to make sure people keep asking us questions, and that we keep showing our interest in answering those questions. We posted all questions and answers on our official blog. The next day, we published an official FAQ section with extended answers, based on the most frequent questions received from the conference. The twitter account kept growing steadily as we used it to communicate with our audience. 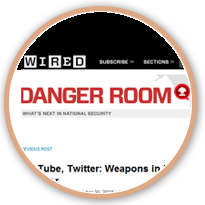 Tweets were sent daily, some promoting related content, some our own content, and some answering the questions that were raised. The key to success was our attempt (and successful execution) of being approachable and down-to-earth. Government or not, we aimed to show there are people behind the brand. Finally, here are some examples for great tweets from the Consulate account. Some are funny, some are an amusing response to snarky comments, and some are just people having fun, and making the brand looks fun as a result.
.@schwinnswan Israel’s borders are open to all people & cartoons regardless of color, religion, sexual orientation or animation style. Our pleasure, @terrypoison! Can’t wait to see you rock out. Thanks, @thesreichert! 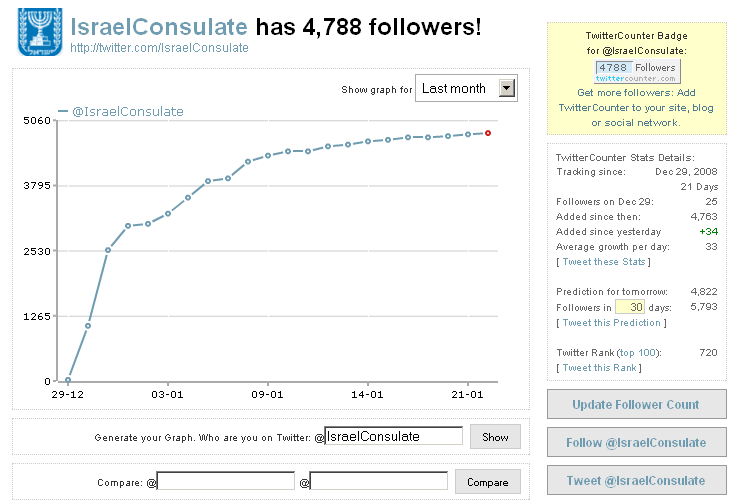 We like to think of ourselves as the world’s tweetiest consulate.